Welcome to another week! How was your weekend? I managed to finish up that pillow. No one is more surprised than I am, trust me. I've been good at starting things and not so good at finishing them. I popped an 18 inch pillow form in there, but I might try and find a 16 inch.. I generally like a nice firm pillow but this might be cuter a little less puffy. I'll send it off to live with Frankie, it's perfect for her sofa. It's fun for right now, Valentine's Day season, but perfect and pink for everyday! I've managed to get my APQ quilt along quilt cut out But more on that later. I don't want to scare you with too many things at once. Too shocking. Pam your pillow is beautiful. 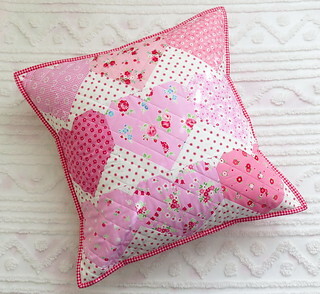 Why aren't you part of the pink book sew along? Your love of that book is legendary and I would have thought you'd be first on the list! I can't wait to see you APQ quilt along quilt. If anyone can make that cute it is you.